Hoagie Hut is a little sandwich shop in Lincoln Park. My friends and I were really hungry one night and were looking for a quick place to grab a bite, so we stopped by here. 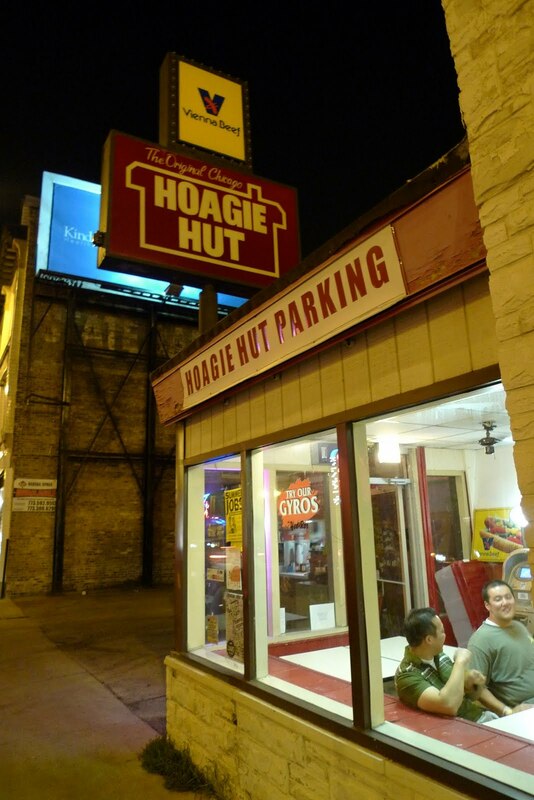 I've never heard of Hoagie Hut, it just happened to be open and we were hungry, a perfect storm of sorts, I guess. Little did I know that Chicago had their own version of cheese steaks and that I'd become a fan. We came here after day 2 of Lolla. I ordered the Chicago cheese steak sandwich last time and really liked it so I got that again. 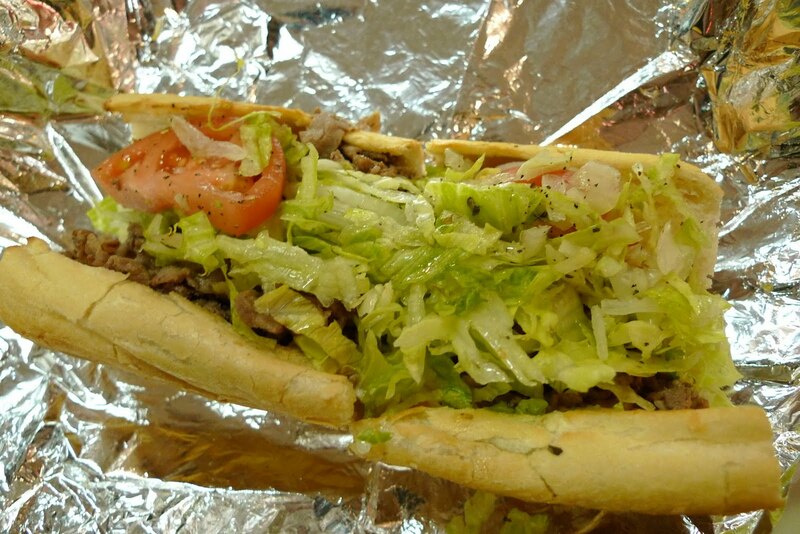 They have Philly cheese steak sandwiches, hamburgers, hot dogs, almost anything really. 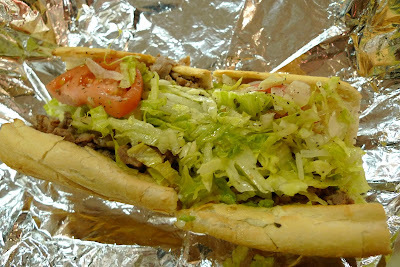 A Chicago cheese steak sandwich at Hoagie Hut consists of thinly sliced beef with a slice of cheese, lettuce, tomato, onion and oil and vinegar dressing. I remember the first time I ordered it, I saw the guy pull out the bread from a drawer, haphazardly chop up some beef on the grill, toss a few veggies together and wrapped it up as fast as could be. Not my idea of appetizing. But I have to admit, for the life of me, I can't figure out why this sandwich is good, but it is. It's oily, greasy yet completely satisfying. A little bit splash of Tabasco sauce makes it all the more better. 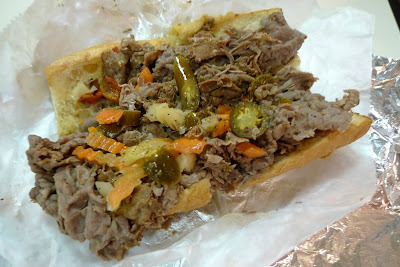 Jung, no surprise, got the Italian Beef Sandwich. He seemed to enjoy his sandwich as well. 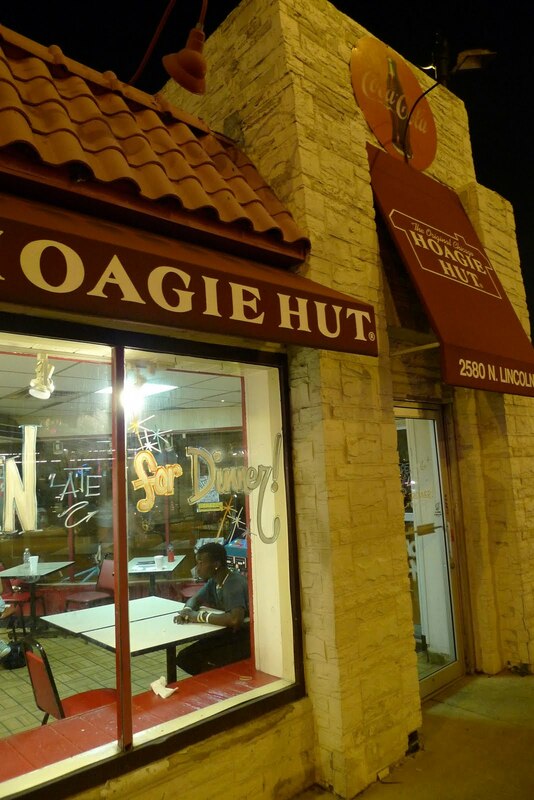 If you are looking for a late night snack, Hoagie Hut definitely fits the bill. They are open later on the weekends too. I'm beginning to think Chicago is the land of sandwiches.